Bone-chilling tunes are on the menu with a new compilation from BuySoundtrax Records: Halloween Horror Hits. 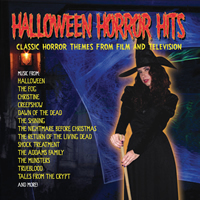 The compilation features some of the scariest music ever written for film and television by composers including Jerry Goldsmith, Danny Elfman, John Carpenter, and John Beal. Scare the bejeezus out of your friends this Halloween with this new compilation, featuring cuts from The Thing, Christine, A Nightmare on Elm Street, and of course Halloween. The album features tracks produced for BSX by such Hollywood Veterans as Dennis McCarthy, John Beal, Dominik Hauser, Joohyun Park, Charles Fernandez and Chuck Cirino. It also features two new versions of songs from the cult classic films Return of the Living Dead and The Rocky Horror Picture Show sequel Shock Treatment by Actress Victoria De Mare (who is featured on the cover of the recording).